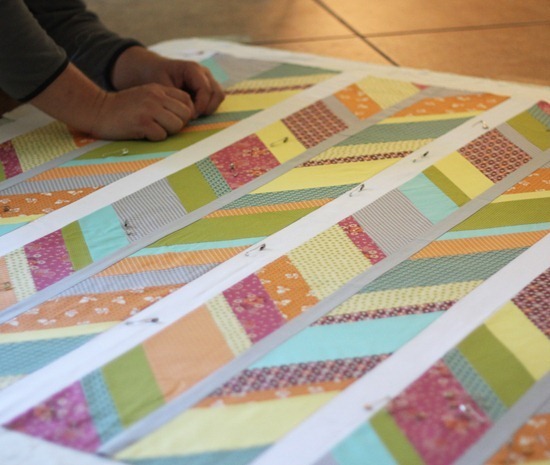 I’m so thankful to Cindy who pieced this quilt and tested the pattern for me. Then she so kindly sent me back the top….my husband basted it (oh yes he did!) and I quilted and bound it while my kids visited their Grandparents. I quilted it with all over loopty-loops (surprise,surprise). I’m really happy how it turned out…these aren’t my normal colors but that purple and orange is such a fun combo. Thank you again Cindy for making the top at the last second! This pattern is Scout and can be found in my shop as paper or PDF here. 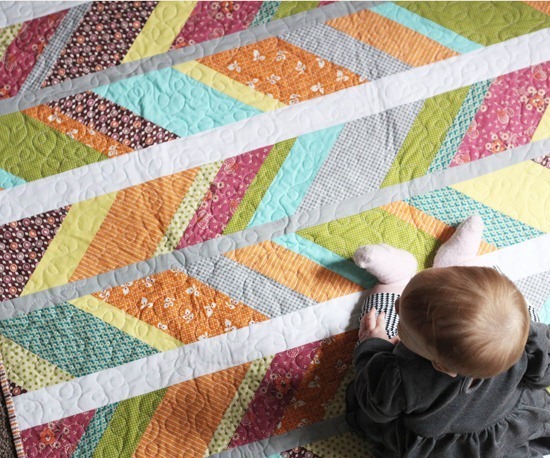 A very sweet quilt, love it! it turned out so beautifully! love the colors. I really love the colors along with the gray and white. The gray really pulls it all together. I absolutely LOVE this color combination! Beautiful work! Cindy did a fabulous job!! My patterns arrived yesterday and I can not wait to make my very own!! WOW! You are extra blessed if you have a hubby that bastes your quilts!! I'm lucky if mine will help me lay it out so I can baste it! :D Turned out gorgeous!! 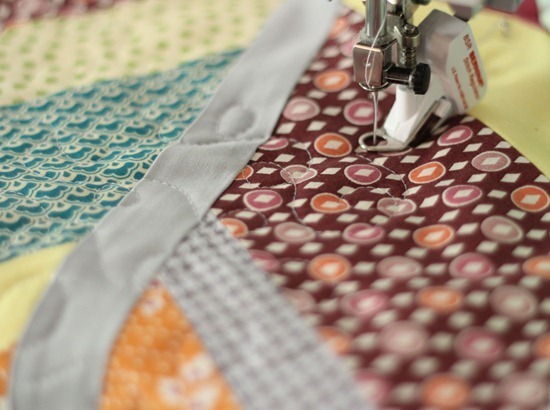 Hi – love the quilt, I recognize the binding as Denyse Schmidt's, love her fabrics! You always do such amazing work! The colors you choose are so vibrant, bright, and cheery. But I have to ask…have you ever sprayed basted with adhesive quilt spray? It's SO much easier than safety pins and will save you a TON of time. Once I started using the spray i never went back. My favorite is 505 Spray and Fix (won't gum your machine or needle). I layer the backing (tape corners down to floor), batting, and top and then I pull back half of the quilt and spray 1/2 at a time. Just a little tip ;) Happy Sewing! Oh I love this one, it really looks like an awesome pattern. So cute! I've been eyeballing a few chevron inspired patterns lately. I want to make my (almost) three boys matching quilts and this type of pattern seems the most boy-friendly while still being able to use a variety of fabrics! And suggestions on a good fabric line for boys? Any color would be great! Lovely lovely quilt. What an amzing husband to crawl around on his hands and knees basting for you. You must be one awesome Hubbie trainer! What is your secret – I just mentioned it to my hubbie and he laughed at me! Wow! Hubby really did it? Cool! I knew he would, eventually! I enjoyed meeting both of you at Market! I can just see my collection of thrift shop neckties made up using this pattern! Love the colors.I agree with the previous comment – you'll have to give us your secret for training the hubby. Gorgeous colours, and good training on the husband! I'm training the 9year up on the next one…lots of bribes needed I think. It was my pleasure. 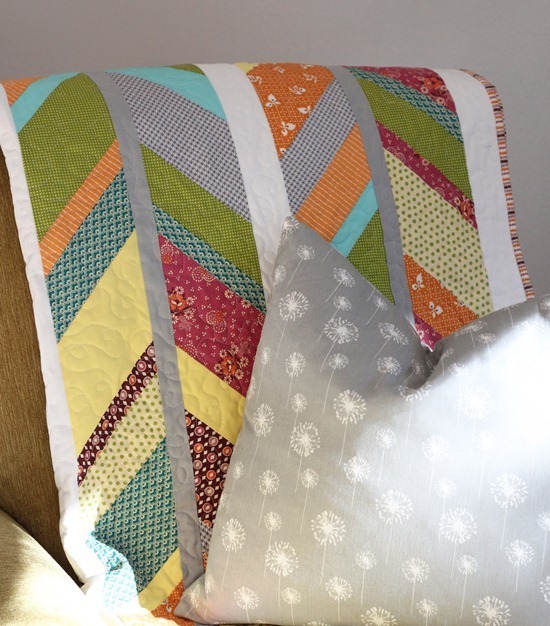 I love love LOVE this quilt!! I'm thrilled to be able to look at it every.single.day! Great quilt, colours are lovely. I love the Christmas towels, is this pattern available? Would love info on it please.